With a single key press you can instantly view thumbnails of all open windows, display thumbnails of windows belonging to the current application, or hide all windows to quickly access the desktop. The Expose feature of Mac OS X is regarded by many as the most elegant and user-friendly way to switch between windows, and is considered to be one of the features that sets OS X apart from Microsoft operating systems. TopDesk brings a Mac OS X Expose-like experience to Windows XP and Windows Vista. 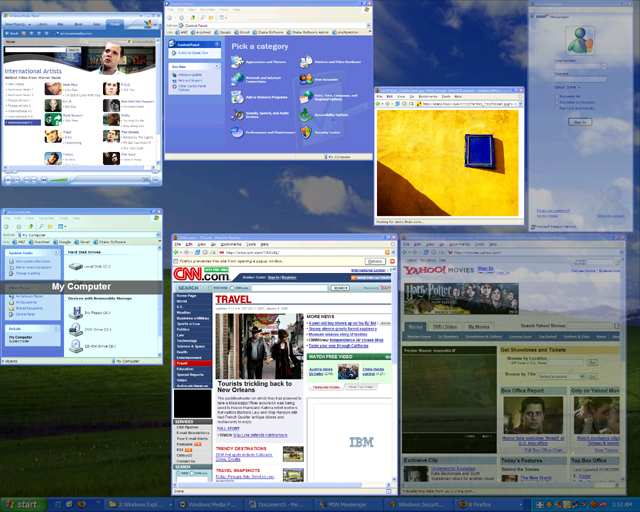 While Flip3D is only available in premium versions on Windows Vista, most Windows XP and Windows Vista Home Basic computer systems are more than capable of running it. With TopDesk, you can harness the full power of your current hardware and experience Flip3D-like window switching on Windows XP and Windows Vista Home Basic. If you're a Windows Vista user you'll know that Flip3D lacks many of the traditional Alt-Tab features, such as quickly switching between the last two applications, that are second nature to most users. TopDesk provides you with a Flip3D-like window switching experience that still behaves like traditional Alt-Tab switching. Windows Vista only lets you use Flip3D when the new Aero interface is enabled, but many users are forced to disable Aero to improve performance. TopDesk gives you a Flip3D-like window switching experience that works even when Aero is disabled. Processo que monitora ferramenta. Controle bens iniciante e depressa aplicações de lançamento.